Time spent in the countryside brings new suggestions. It's a great time full of new inspirations, projects and posts :). More days like these... 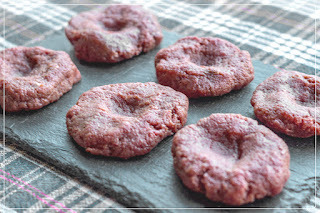 It's rainy day, and that's perfect time for making new tutorial "Burger party" from yesterday. 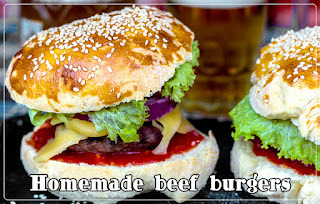 We are coming with full recipe for homemade sesame buns and great beef burgers and cool quick video. So, can we start now? Yes, we can! Stir together well and leave for 10 minutes. Blend it by hands for 8 minutes. Make nice dough, leave it for 90 minutes under a cloth. Brush egg yolk on buns and sprinkle with sesame. Bake for 10 minutes at 190°C. You can buy minced meat or grind it at home, we made it with our old grinder, that was really hard work. Blend it with the meat by hand. Make 6 pieces of burgers. Make dimples into the middle of each burger with your thumb and grill them well. Chop veggies, prepare ketchup and cheese and we can start adding ingredients.